I'm flapping, almost as much as this tent in the wind. We've got hours until our booked time for the Chunnel and it is apparently not advisable to be at the station more than an hour before. But what if there's roadworks? What if there's a problem with the bike? What if we get a puncture? What if what if what if....so I'm flapping. As I've said before, travel is not something that comes easily or naturally to me. I'm already getting cross with the gf for not getting up right away and jumping to it sharp style. Each time I do something I think "this will be the last time I..." I make it sound so permanent, as though I'll never camp, never ride or never have fun again. It's silly and I tell myself to stop. "This will be the last time I'll have to stuff these bloody sleeping bags into these tiny stuffsacks". I know I'll be doing it again some day, but this is one job, one thing about this trip that I won't miss. It's such an awkward, fiddly, thankless task. That and getting the blinking air out of the gf's lilo. It's not hard, it just takes ages. Even with the gf messing around with make up, hair straighteners, ablutions and generally being a girl I manage to be ready to roll in good time. Time is on our side so I'm flapping about being too early but I can't stay here and chill, because I'm flapping. As soon as I hit the road and I have something to do, as in riding the bike, I can relax. I feel like I'm working towards something and that makes me feel constructive and useful. I like feeling constructive and useful. It seems an awful long way to the terminus today, am I lost? No...no I'm not lost and I'm not late. Not at all. Not by a long shot. In fact I'm early. What a surprise. Strangely though I'm not so early that we have time to get bored. By the time we've had a chat with and an envious look inside an elderly couple's campervan and been to the toilet, we can climb back onto the Fazer and roll, slowly, towards our train. A queue leads to a line of cars, the line of cars leads to a queue and another biker joins us in another queue as we get ever closer. Now...remember that "event" at the motorway toll booth as we tried to escape from Monaco? Of how I expect to be arrested for none-payment? Well here I am about to hand my passport over to the French Douane. I expect he'll look at it and scan it. As soon as it scans lights will glare, sirens will go off and I'll be surrounded by armed guards. Nope. I smile and receive a curt dismissive wave. Now British passport control. Maybe the French have alerted the British to a potential incoming criminal? Nope. I grin smugly, they'll never take me alive I tell ya...NEVER! Another queue takes us onto the now almost familiar Chunnel train. We're joined by another couple on a large Japanese cruiser. He's proudly displaying his MCC patch on his leather cut and asking me about my bike club. It takes a while for him to realise that our club is not "serious" or old school, he seems disappointed even though I wear a cut too. They share tales of great rides and bad weather on their trip, I get the feeling they missed the worst of it though, they've only had a "few bad days". In fact the problem with the Chunnel is the crossing is so quick we don't have time to finish our conversation. Whoa! Ride on the left Ren...the left! In fact it takes less than a minute to feel comfortable to be riding on the left again. Some people tell me they can switch sides without barely a thought, I think I'd have to spend a year on the continent before I became fully "acclimatised" to riding on the wrong side of the road. I take the motorway today, I used the A roads through Hastings last year and it took an age. And that's it! Before we know it we're having a brew at Box Hill and then we're at my Dad's place. Job done, holiday over, adventure had and now it's back to reality. 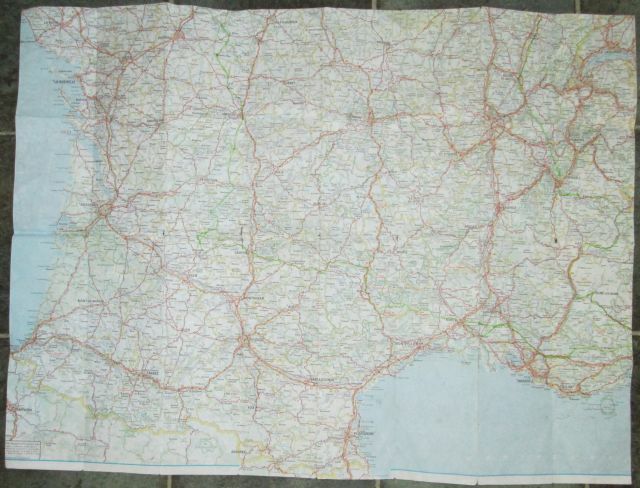 The battered, soggy and ripped map of France that proved so useful.